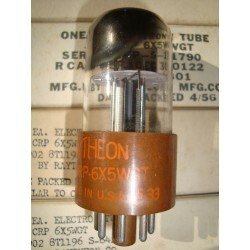 Top quality vintage general purpose voltage amplifier tubes manufactured in the United States by Zenith. These 4-pin tetrode mesh plate glass tubes, designed for battery operated radio receivers, come glass etched 32, and printed on base in yellow ZENITH MADE IN U.S.A. 37 13 29 REPLACE ONLY WITH A GENUINE ZENITH TUBE. Boxes are standard Zenith red with eagle shield, printed 32.